Volleyball is an entertaining and healthy sport which is a craze for the fitness enthusiast. However, adding some additional yet creative effort to it makes it lovelier. You might be wondering what kind of innovation I am talking about a casual game. Well! The human mind is made for innovation and improvement to fetch something better day by day. Here, I am talking about the “Snow Volleyball”. Snow volleyball is basically identical to volleyball, but it will be played on natural or artificial (man-made snow parks) snowy platforms with great zeal and enthusiasm. It was during 2017, the FIVB (FEDERATION INTERNATIONALE DE VOLLEYBALL) took effective steps to increase an awareness of the fun, passion and universality of the sport. The organization aims to make Volleyball accessible from summer to winter, from the beach to the mountains, indoor and outdoor at any time, any place, anywhere. In this way, this vision gives rise to the innovative sport of Snow Volleyball. Being the best and finest family sport, Snow Volleyball also creates a sense of unity and peace among the family members. Basically, there is no specific uniform for Snow volleyball. However, the players wear thermal underwear under the existing volleyball uniform, i. e., synthetic t-shirts and shorts with some promotional logos. It helps you to remain warm in negative freezing temperatures. Also, football boots are worn to hold the grip on the snow and prevent from sliding. 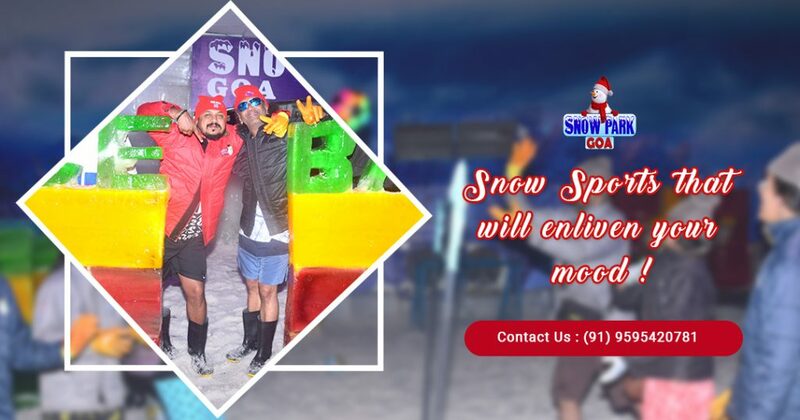 When we talk about Snow Volleyball in India, no state, except Goa could be judged it the best. Being situated near the seashore, Goa has the moderate climate round the year. Goa is well known for its incredible contributions in the tourism industry of the country and constantly and efficiently strives to create better options. Hence, there emerged a beautiful amusement park in Goa with the unique theme of “Snow” named as ‘Snowpark’ in Goa. There are about 345 different kinds of snow activities to enjoy and relax. Snow volleyball is one of them. There is a provision of uniforms, boots, caps or helmets, etc. You could come up with your family and spend some quality time with them. Playing Snow volleyball also benefits you and your family’s health. While playing Snow Volleyball, the entire body muscles get flexible and help you develop a hardy constitution. Apart from Snow volleyball, there are various other sports activities in Goa to play and enjoy. Thus, stop wasting your time and come to Snowpark in Goa to spend your holiday comfortably and lavishly.